How can this man be this dumb? For real? A man wearing a Donovan McNabb Eagles jersey held up a bank in Northeast Philadelphia Tuesday and fled with an undisclosed amount of cash, authorities said. 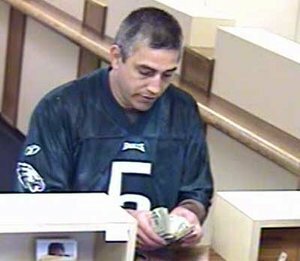 About 2:30 p.m. the bandit strode into the PNC bank branch at 6855 Frankford Avenue and threatened a teller with violence. "He said he had a weapon and was going to use it," said FBI spokesman J.J. Klaver. The man made no attempt to hide his face from the bank's surveillance cameras. "These are probably the best bank robbery pictures we've seen," Klaver said. The bandit - who is considered armed and dangerous - is described as a white male, about 45-years-old and stands about 5-foot-8. He has closely cropped dark salt-and-pepper hair and is clean shaved.